Here’s something regular review readers don’t get from me very often: I wish this episode had been longer. After what was basically a filler issue last week [and one that seriously had me picking apart Han’s place on the show] this Monday night had us returning to the narrative that this half of the season has built itself around: the pastry school and Max’s relationship with Deke. That’s right, Eric Andre is back after his character had the flu and went on a skiing trip. Every move this show has made so far, including the mild inconvenience that was Max finding out he was wealthy, has pointed towards him sticking around. She’s not one for relationships or even trusting others, and the way they’ve grown closer has made it seem like nothing short of death/something truly dramatic could break them apart. So this week the two girls meet Mr. and Mrs. Bromberg [as in the Bromberg Elevators, the ones that are in every building in the city, as in the Bromberg Colo-Rectal Centre at the New York Hospital]. Exhibit A from my review of Episode 17. –and I need to calm down. I’m going to let that image speak for itself. And breathe slowly and deeply. If you really want to read more about my quibbles outrage over continuity you can check the link above. Now normally I try not to recap entire episodes, because presumably you’ve already watched them otherwise why would you be reading this, so I’m going to do what I was going to do two paragraphs ago and get to Deke’s parents. Right before I do I’m going to mention and link to, for the last time ever I swear, an article stating that 2 Broke Girls is “The Closest Thing We Have To A 99 Percent Movement Comedy“. Everything about it makes it the perfect show to discuss ideas about poverty and wealth, the disparity between the grossly rich and the wretchedly impoverished. The reason I bring that up is because Deke’s mother, played by Sheryl Lee Ralph, used to be poor. She confides to Max, and us, that “I am from Queens, New York. Yeah, that’s right, I’m just Genet from the block.” While that last line may have been a lazy joke referencing a JLo song, it really does sum up her character in a mere six words. Hers is the exact opposite experience of Caroline’s, going from having nothing to being loaded, and there’s a lot of potential there. The very fact that she reveals to Max that she used to be a stripper speaks to the kinship the two share over having [and having had] nothing, and it’s a shame that the internal conflict between her past and present lives is extremely minimal. When the Brombergs’ family friends Adam and Amy visit and find out who Caroline is they are none too pleased [“Cannot believe you would invite a Channing into your home.”]. Apparently her father’s Ponzi schemed cost them some dough, relegating them from the penthouse to the fourth floor. Look, pause, I’m sorry but pause. Max gets pissed at them because they’re making too big a deal out of things, but money is money. That’s tens if not hundreds of thousands of dollars lost. I’m not saying they shouldn’t be grateful for what they have left [which is a lot, mind you], but they do deserve to be angry. Anyway, that’s when Genet very gently tells her son’s girlfriend to step off with a, “Max, these are our friends.” It’s maybe not as explicit as the episode’s creators might have liked, but it’s fairly apparent that the steps she takes to resolve the conflict are rooted not only in her sense of propriety but also her loyalty to Max as another girl who’s lived a hard knock life. That’s what I really wanted to see more of, because that struggle alone makes her more compelling than Oleg, Sophie, Han, and Earl combined. Then Max ruins everything by spilling the beans that Mrs. Bromberg was once a dancer of the exotic variety. I’m going to address that in a bit, but first I want to get to the episode’s conclusion and dig up an idea I introduced seven episodes ago, which is that with Deke entering the picture 2 Broke Girls has taken an explicit turn tonally towards more of a rom-com approach. After their visit turns out to be a bust and their son sides with his girlfriend the Brombergs cut him off financially, and Max is left feeling that it’s all her fault. While this scene provides a return to the show stating how she and Caroline are BFFs, it’s also one of emotional maturity for her. She says that Deke can’t survive being a poor person, but that all really translates to is her believing that she’s holding him back. Kat Dennings’ acting is spot on, too, and she really lands the emotional beats. With her and Caroline literally pushing his dumpster house back to his parents at two in the morning it’s an unexpected turn of events, and one that legitimately has me looking forward to next Monday night. Genet met her husband David back in her stripping days, and these are two tumblr users who don’t like the implications of that. While the first one makes a few too many assumptions, they both land on the fact that she was “rescued” from her former life by this White guy. They of course look past the fact that the two ostensibly love one another, but the truth is that made her way out of destitution by another person’s efforts with the races of both parties being severely scrutinized. I personally don’t think it’s something to dissect [and I am all about positive racial representation in media] but it’s certainly something to think about. New Total: $2,850. Explained within the episode! With the pastry school shut down the cheques for the spring semester’s tuition were returned to all of the students. The Title Refers To: The Brombergs, who are rich. Probably the dullest title the show’s ever given us. Where are the double entendres? I fully realize that these reviews are reaching VanDerWerffian word count levels. Big gay John knows why Lady Gaga’s last album failed. I want to know this, because it had “Applause” on it and that song is great. Caroline and Nicolas “made out once in six different places on eight different occasions.” I very much want to know if this matches up to past episodes. Deke’s parents love pop art. Max eats soup. Jeff Garlin as Mr. Bromberg is inspired casting, and makes me realize how I can recognize him immediately without being able to name anything he’s in. Max had her feelings hurt in the 8th Grade by a boy named Tommy Dolan. Adam and Amy love naughty comedy, they watch Bill Maher. Tilapia is not, and I know this for a fact, a chickeny fish. 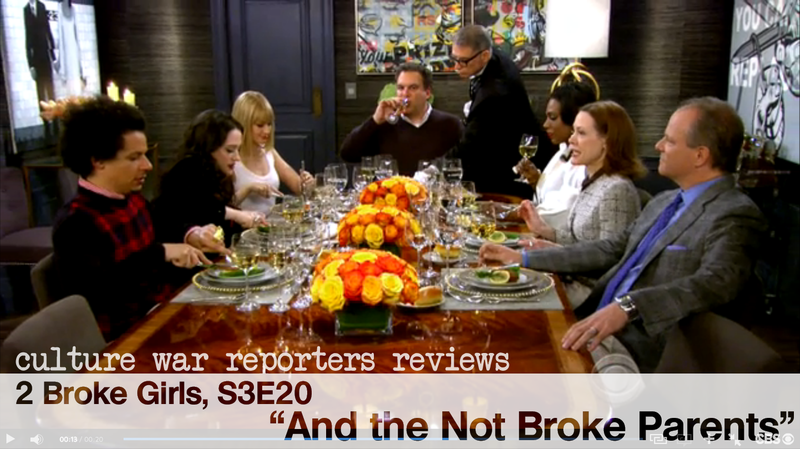 2 Broke Girls Cheesecake Menu: Caroline lends her pearls to Max, and it is the nakedest I have ever seen her. This entry was posted in Comedy, money, race, review, television and tagged 2 Broke Girls, And the Not Broke Parents, Beth Behrs, Brombergs, Caroline, Cast, CBS, characters, Current Total, dancer, David, Deke, from the block, Genet, Jeff Garlin, Kat Dennings, Max, money, pastry school, poor, review, rich, S3E20, Sheryl Lee Ralph, Stripper, television, Todd VanDerWerff, TV, wealthy. Bookmark the permalink.